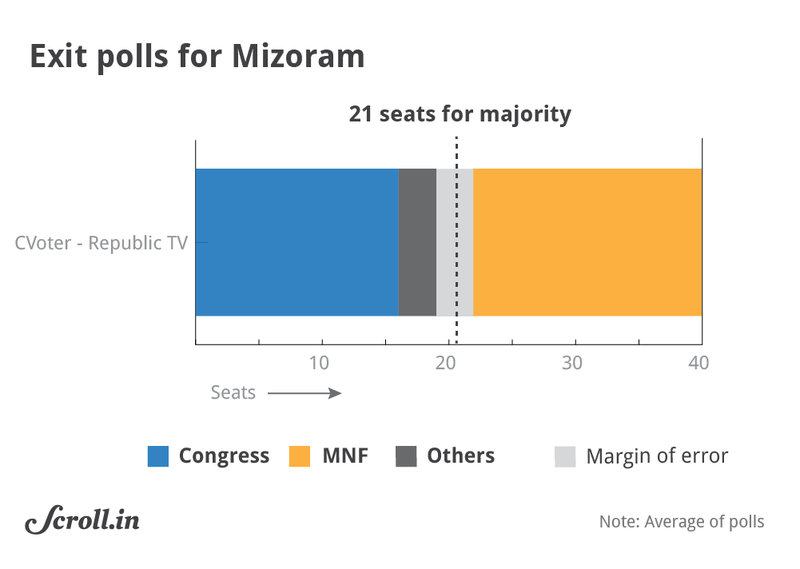 The Congress may not get a third straight term in Mizoram, the exit polls showed. (Left to Right) Chief Ministers Lal Thanhawla of Mizoram, Raman Singh of Chhattisgarh, Vasundhara Raje of Rajasthan and Shivraj Singh Chouhan of Madhya Pradesh, and caretaker CM K Chandrasekhar Rao of Telangana. No third party is expected to provide a significant challenge to the BJP and the Congress in any of these three states. The exit polls came after polling closed on the last day of elections, which saw votes being cast in Rajasthan and Telangana on Friday. The other three states had already voted in recent weeks. Votes for all states will be counted on Tuesday. 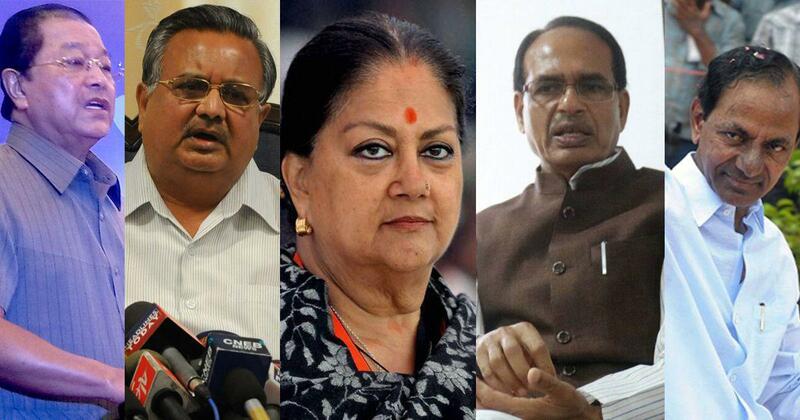 The Rajasthan Assembly has 200 seats, of which 199 went to polls on Friday. According to Times Now-CNX, the Bharatiya Janata Party is likely to win 85 seats of them and the Congress-led alliance will win 105. The Congress is likely to lead the tally according to India Today-Axis My India too, with 119 to 141 seats. 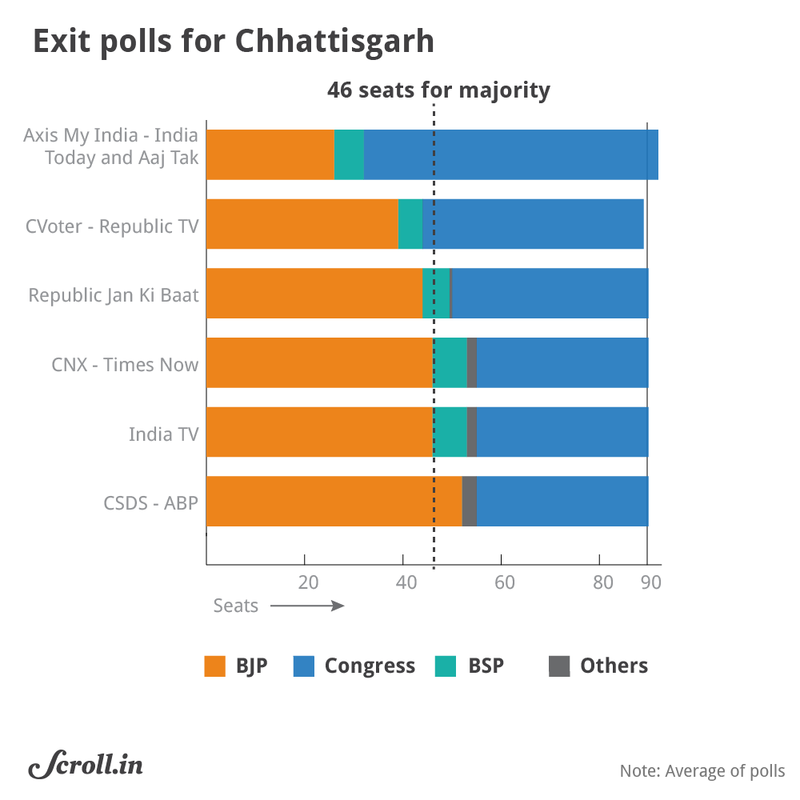 The BJP will lag behind at 55-72, according to this exit poll. The prediction by Republic TV-CVoter is similar – 52-68 for the BJP and 129-145 for the Congress. Jan Ki Baat has forecast a much tighter race, with the BJP winning 83-103 seats and the Congress 81-101. The Congress will win 35 seats and the BJP 46 seats, according to projections by Times Now-CNX. The Bahujan Samaj Party-led alliance is likely to bag seven seats. Republic TV-CVoter has put the tally for the BJP at 35 to 43 and the Congress at 42 to 50. The Assembly has 90 seats, with the majority mark at 46. According to an India TV exit poll, the BJP will win 42-50 seats and the Congress 32-38. The Congress will have a comfortable win with 55 to 65 seats, according to India Today-Axis My India. 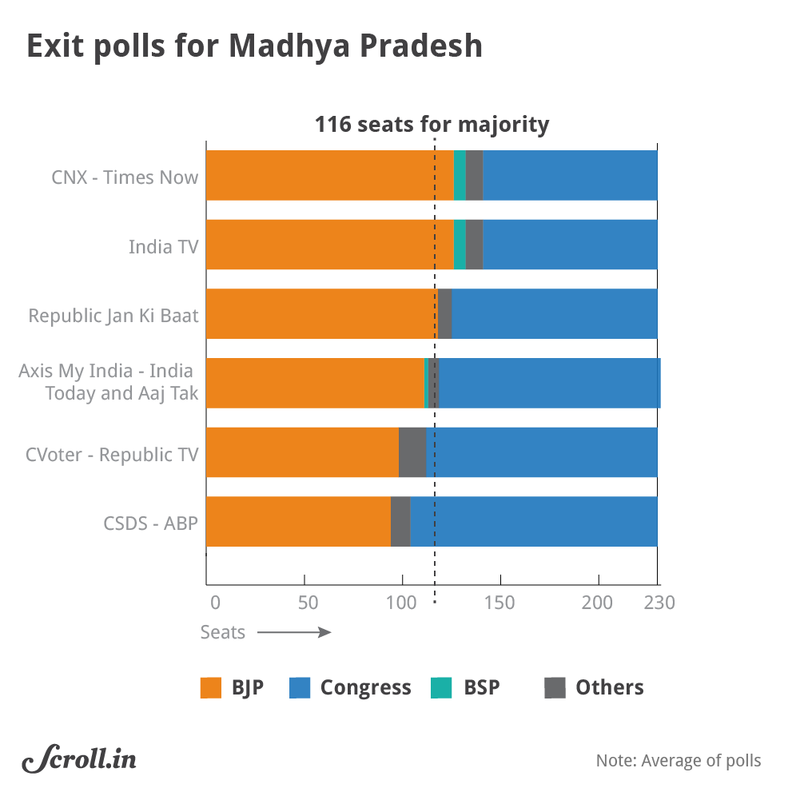 The BJP is forecast to win 21-31 seats, this exit poll showed. An exit poll conducted by Jan Ki Baat has predicted 40-48 seats for the BJP and 37-43 for the Congress. 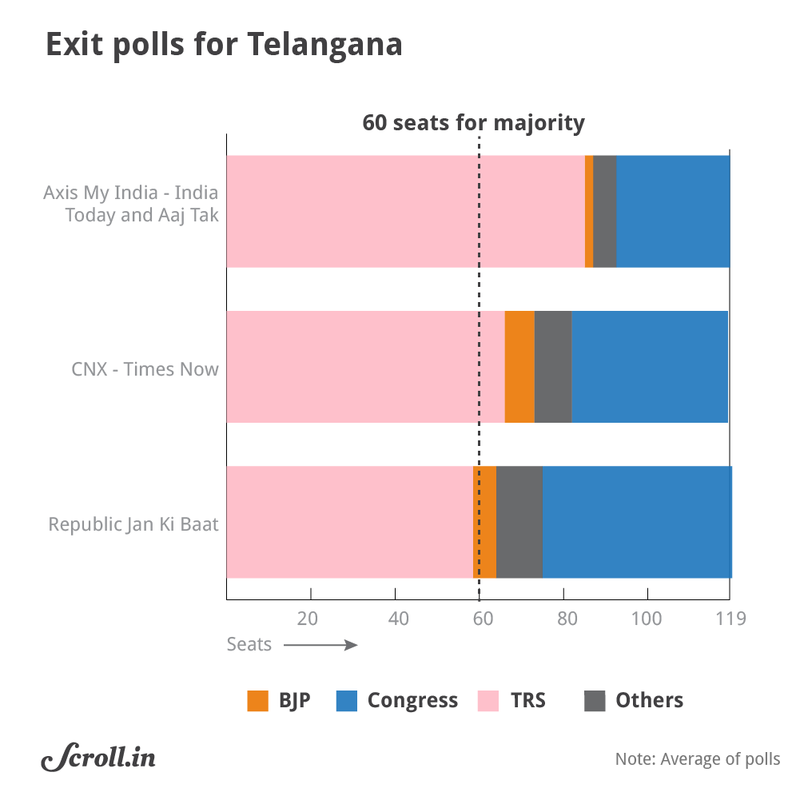 In Telangana, the ruling TRS is likely to win 66 seats and the Congress 37, projected Times Now-CNX’s exit poll. The exit poll by Jan Ki Baat predicts 52 to 65 seats for the TRS and 38 to 52 for the Congress. The Bharatiya Janata Party’s Shivraj Singh Chouhan may be in for a fourth straight term according to Times Now-CNX, which has forecast 126 seats for the party. The Congress will be far behind with 89, the exit poll said. Other exit polls, however, predicted that the race might not be as comfortable. With the majority mark at 116, the ruling party may lose power by limiting its tally to 90 to 106 seats, according to Republic TV-CVoter. According to this exit poll, the Congress will win between 110 and 126 seats. India TV-Axis My India has predicted 102-120 seats for the BJP and 104-122 for the Congress. According to Jan Ki Baat, the BJP will bag 108-128 seats and the Congress 95-115. 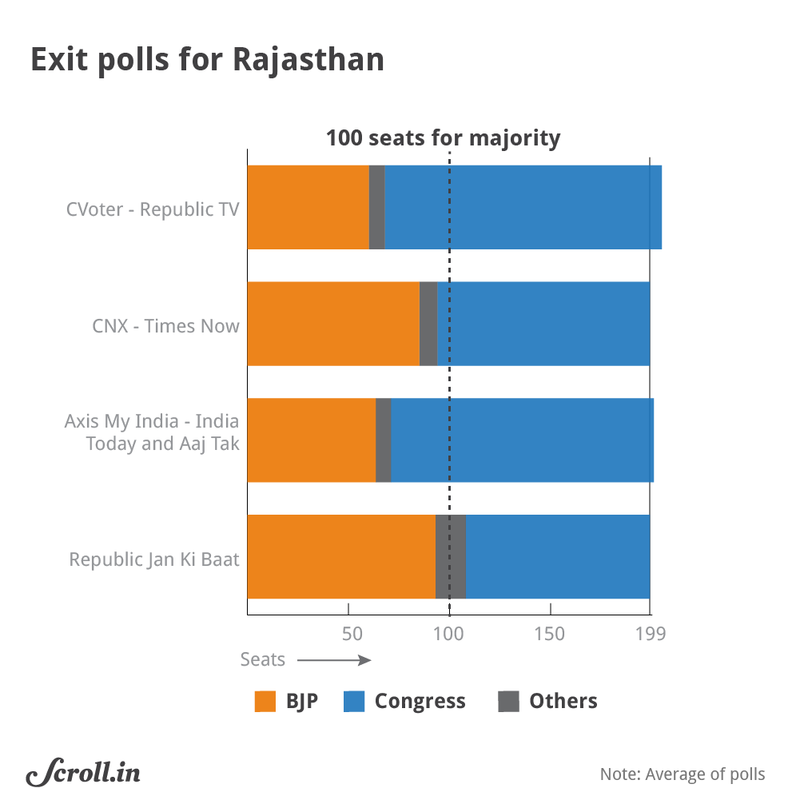 An exit poll by Republic TV-CVoter has predicted 14 to 18 seats for the ruling Congress, against the 34 seats it had won in the 40-member Assembly in the last elections in 2013. 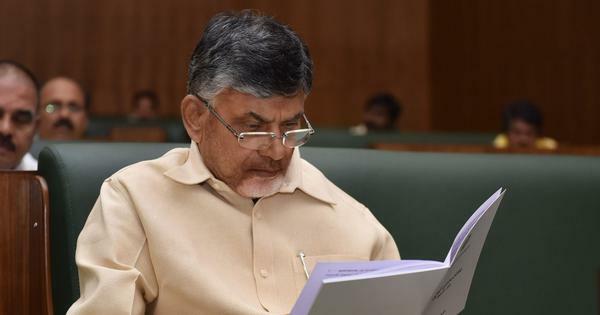 The Opposition Mizo National Front is likely to bag 16 to 20 seats – even the upper end of the estimate would lead to a hung Assembly, which could bring the Bharatiya Janata Party in the picture.